Lasagna is one of those meals that screams family and comfort at the same time. 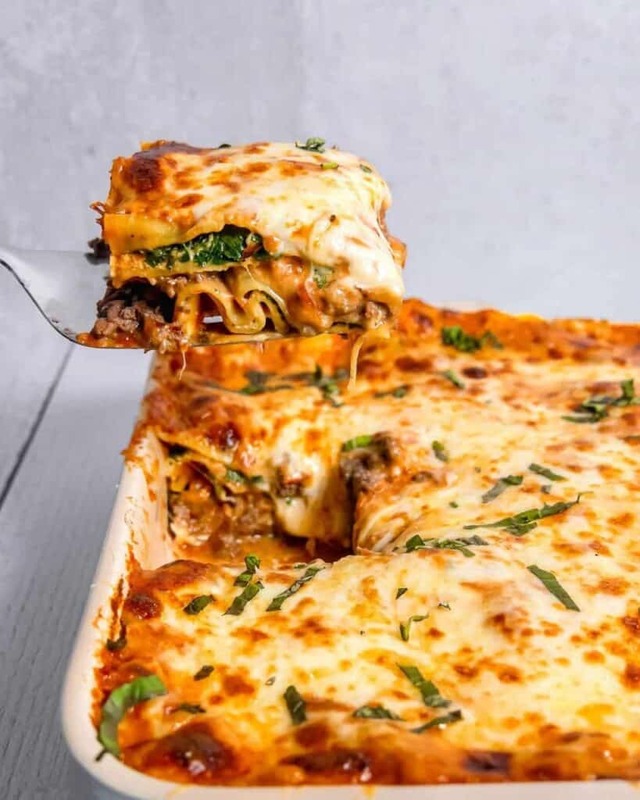 The delicious layers of meat, bechamel, spinach, and cheesy goodness served family style gives me all the feels. 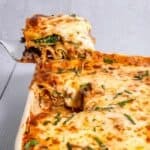 There are so many different ways to make lasagna and to fill each layer. I wanted to go for something simple, but that delivered on flavor. Beef lasagna is my favorite, but decided to throw some spinach in there so we had some greens. I sautéd the spinach with some garlic, removed it to a small bowl and mixed in some freshly chopped basil. Next the beef. I will admit when I first made this recipe I used ground sirloin because I like how it’s lean, but it didn’t really pan out well in the dish. 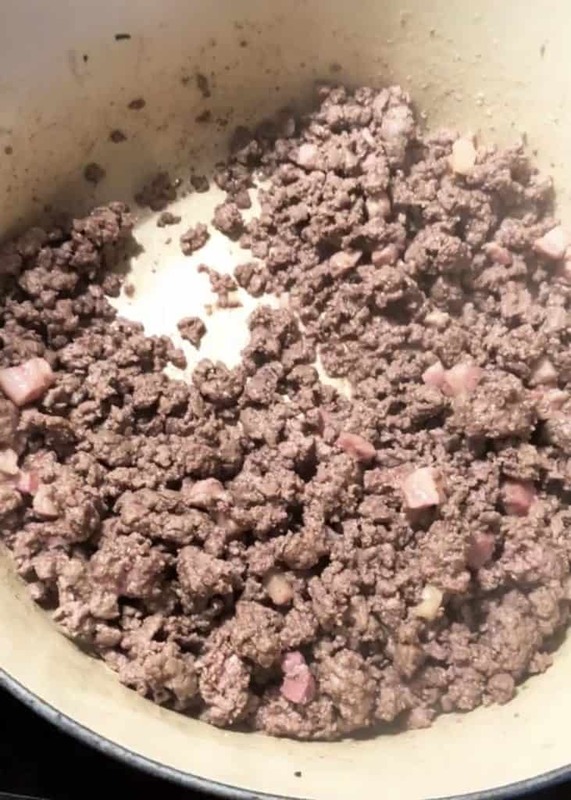 I feel that you need some fat to help bring out the flavor in the beef, so I recommend using ground chuck. I also crisped up some delicious pancetta for a different texture element and extra flavor. You can do just ground beef if you don’t want to incorporate pork into the recipe. For the sauce, I started off with some aromatics. 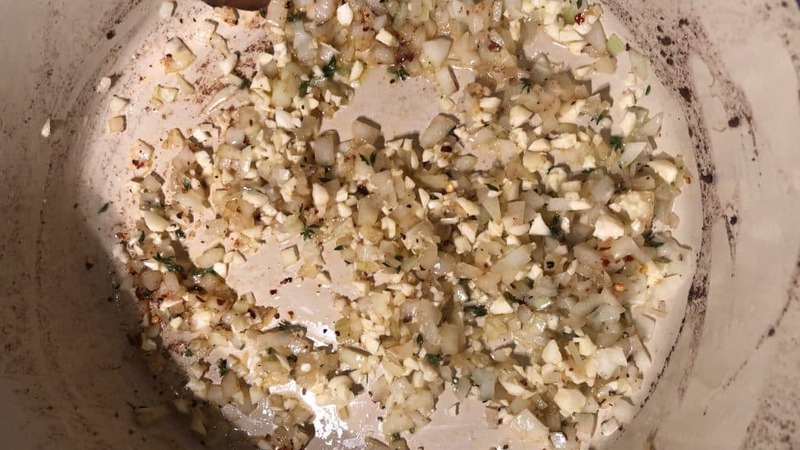 Onion, garlic, and thyme. Note the picture above where I removed the meat, but didn’t fully clean it out so the beef bits could help flavor the sauce. I added fire roasted crushed tomatoes, some herbs and spices, then passed the immersion blender through to get a smoother consistency. Next up is the bechamel sauce. Bechamel is a white sauce made with butter, flour, and milk. It’s traditionally french, but can be added to other sauces as a base for other sauces. In a small saucepan, melt the butter. 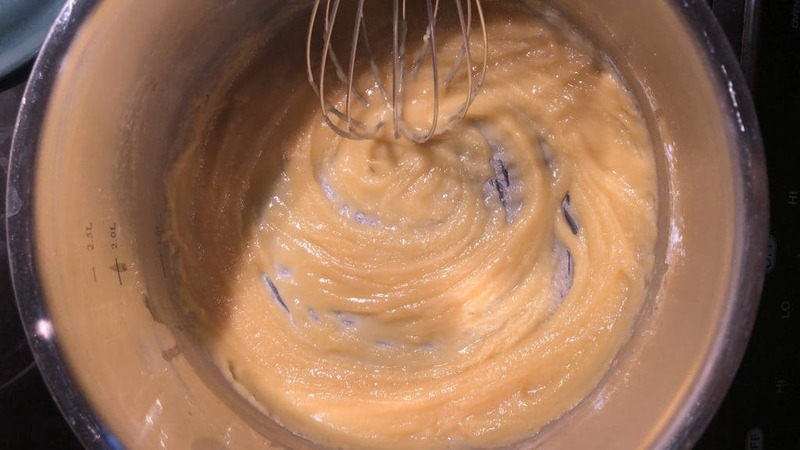 When it’s fully melted, whisk in the flour until it makes this beautiful smooth roux above. Then I slowly whisk in the milk. 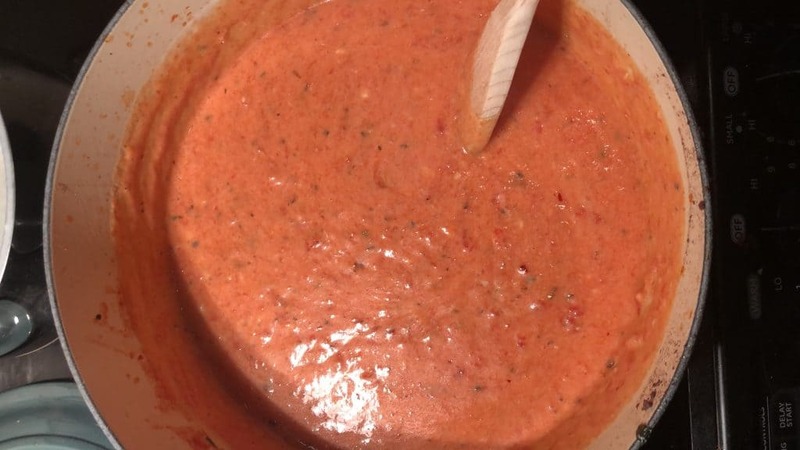 You’re going to allow the sauce to thicken, stirring every so often so it doesn’t burn. You’ll know it’s ready with the wooden spoon test. 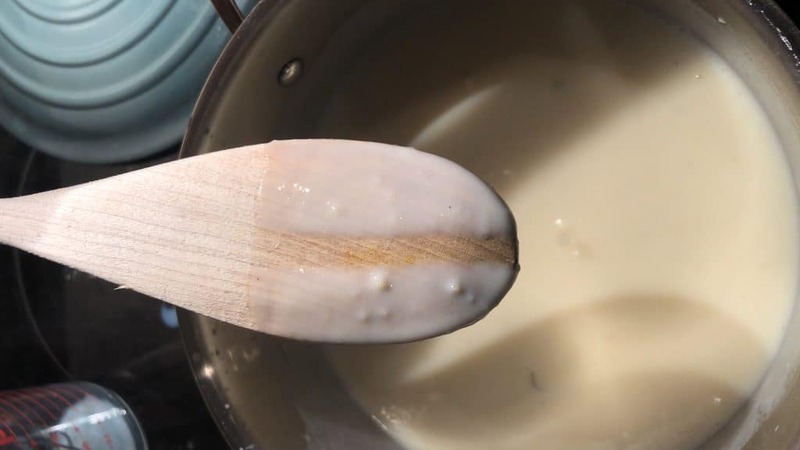 Dip a wooden spoon in the sauce and run your finger down the back of the spoon, if it stays separated then it is ready and thick enough (careful it can be a bit hot). Then add the bechamel to the tomato sauce and stir it in until its fully combined. You’ll be left with a beautiful pinkish sauce that is going to be the “glue” between all these wonderful layers! Now comes the fun part, the layering! 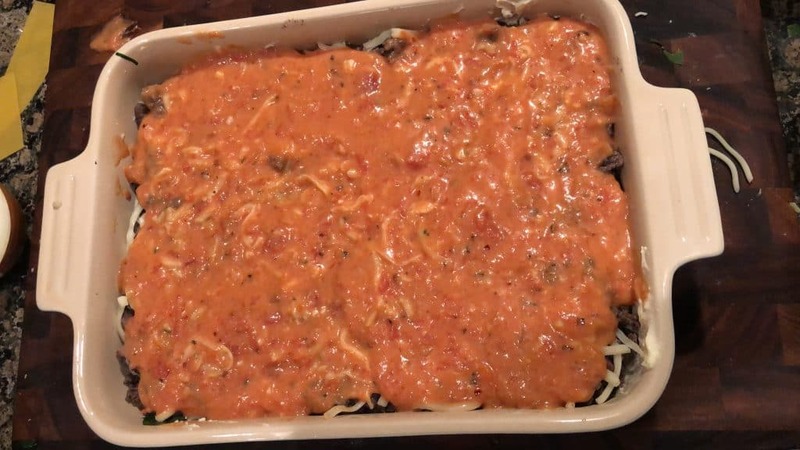 In a baking dish spread an evenly thick layer of your sauce on the bottom. They lay down your lasagna sheets. Next you’ll carefully spread your ricotta cheese & egg mixture. I used a spatula to spread it evenly over the pasta sheets. Next lay down half of the spinach/basil mixture over the top of the ricotta. Followed by another sheet of pasta. Then lay down your cooked beef and sprinkle half the mozzarella on top. You’re going to add more of your tomato bechamel sauce on top of this. After the bechamel, add another sheet of pasta, then the ricotta, and the last of the spinach mixture. Finally add one more sheet of pasta, more sauce, then we are going to top it with mozzarella and fresh parmesan. Before putting it in the oven I like to add a few tiny pieces of softened butter so that we get that golden brown top. Cover with foil, and into the oven! 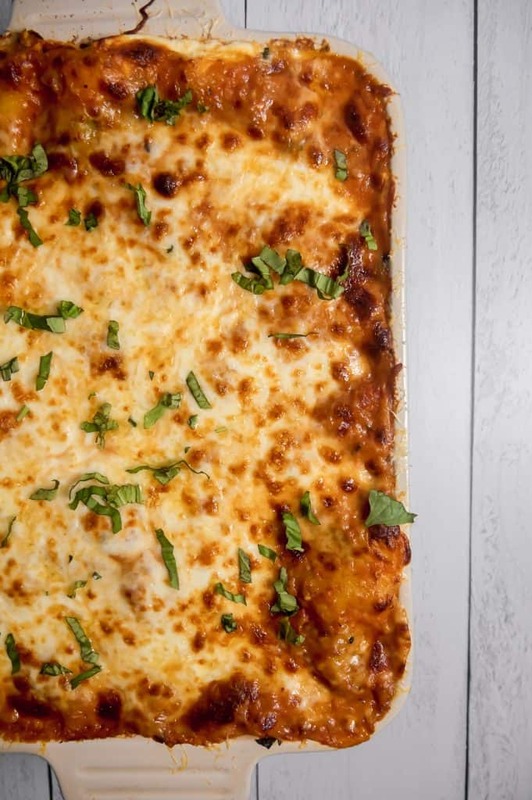 If your lasagna dish is full to the brim (which it should be), you can put foil on a baking sheet and then put the baking dish on top of that to guard from spills. 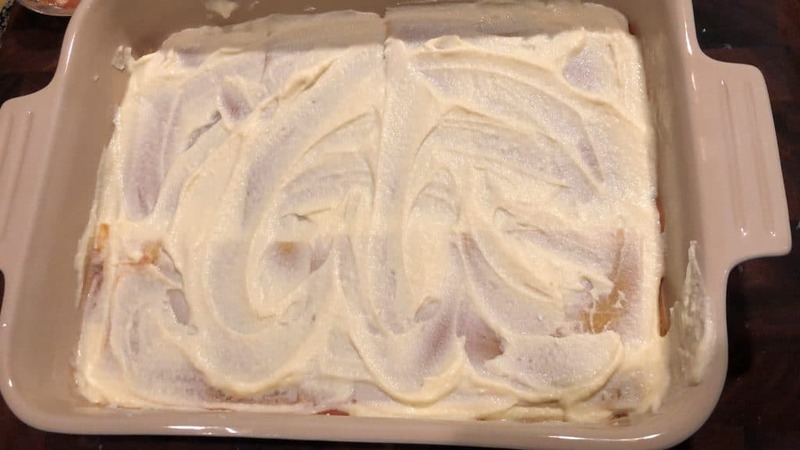 After baking for 35 minutes, I removed the foil from the top and low broiled it for about 10 minutes/until the top was beautifully brown and bubbly. I actually took this photo the following day as leftovers because you could see the well defined layers better. Each layer lending it’s own special flavor to the whole dish. 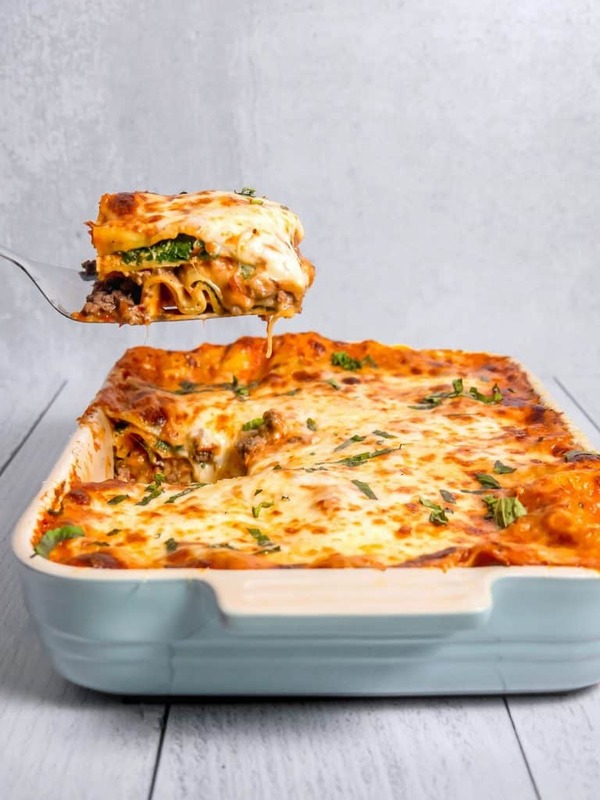 This spinach and beef lasagna is the perfect family meal to enjoy together and create memories at the dinner table. I hope you enjoy! 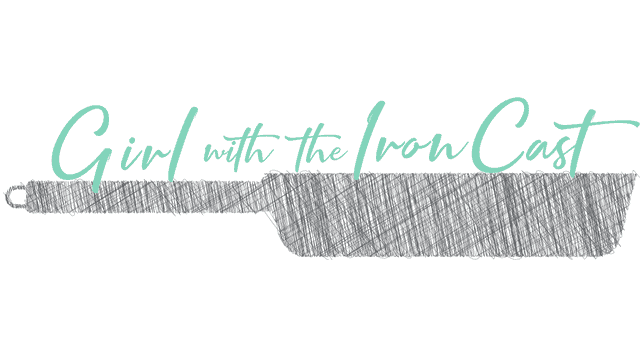 Things you’ll need: dutch oven, sauce pot, rectangular baking dish, whisk, can opener, immersion blender, mixing bowls, aluminum foil. Spinach and beef lasagna with a homemade bechamel and tomato sauce baked to golden brown cheesy perfection. In a dutch oven or large skillet, over medium heat, add 1 tbsp of olive oil and 1 tbsp of minced garlic. Sauté for 1 minute until fragrant then add in chopped spinach. 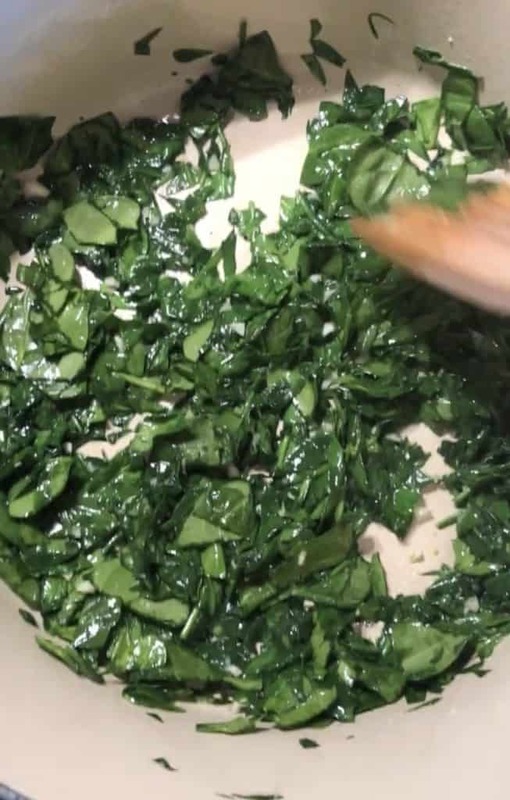 Sauté until spinach begins to wilt, about 4 minutes. Remove with a spoon and set aside in a bowl. In the same dutch oven, turn heat up to medium/high, add 2 tbsp of olive oil and the diced pancetta. Cook until it begins to crisp up about 4 minutes. Add in the ground beef, 1 tsp of kosher salt, 1/2 tsp of black pepper and cook until beef is browned and cooked through. Reserve 2 tbsp of the juice, drain the beef and set aside in a bowl. Mix in the 1/2 cup of basil into the spinach mixture. In the same dutch oven over medium heat, add 2 tbsp of olive oil and the chopped onions. Sauté for about 4-5 minutes until they begin to soften. Add the rest of the minced garlic, 2 tbsp fresh thyme leaves, and sauté for a minute. Add in the can of fire roasted tomatoes, 2 tsp crushed red pepper flakes, 1 tsp kosher salt, fresh ground black pepper, 1 tsp oregano. Mix all together, lower the heat and cover, to allow the flavors to meld while you make the bechamel sauce. In a small saucepan over medium heat, melt 5 tbsp of butter. Once fully melted, slowly whisk in the flour constantly stirring so no lumps remain. Slowly add the milk while whisking continuously and grate some fresh nutmeg into the sauce. Allow the sauce to thicken for 10 minutes, stirring frequently so the sauce doesn’t burn. Taking a wooden spoon dip it in the sauce, run your finger on the spoon (careful it’s hot) and if the sauce doesn’t run together, then it’s ready. Going back to the red sauce, using an immersion blender, smooth out the sauce. Taste and adjust salt if necessary. Add in the bechamel sauce and stir to combine, it should now be a pink color. Turn heat off. 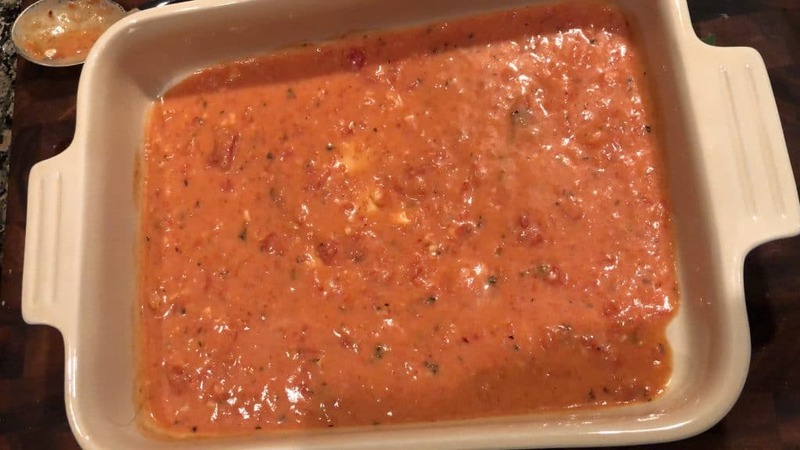 In a rectangular baking dish, spoon a thick even layer of the tomato bechamel sauce onto the bottom of the dish (1/3 of the sauce). 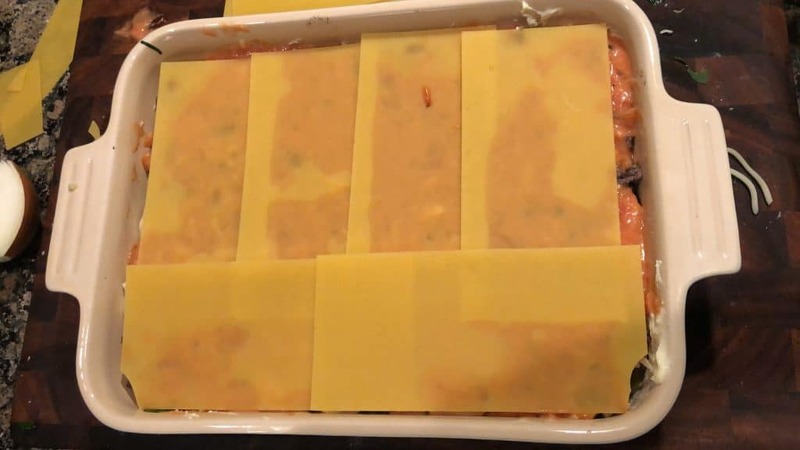 Then add a layer of lasagna sheets side by side. Using a spatula smooth half of the ricotta mixture over the pasta, followed by half of the spinach mixture. Add another layer of pasta, followed by the beef, and then 1/2 of the mozzarella cheese. Spoon another layer (1/3) of the tomato bechamel sauce, followed by another layer of pasta sheets. 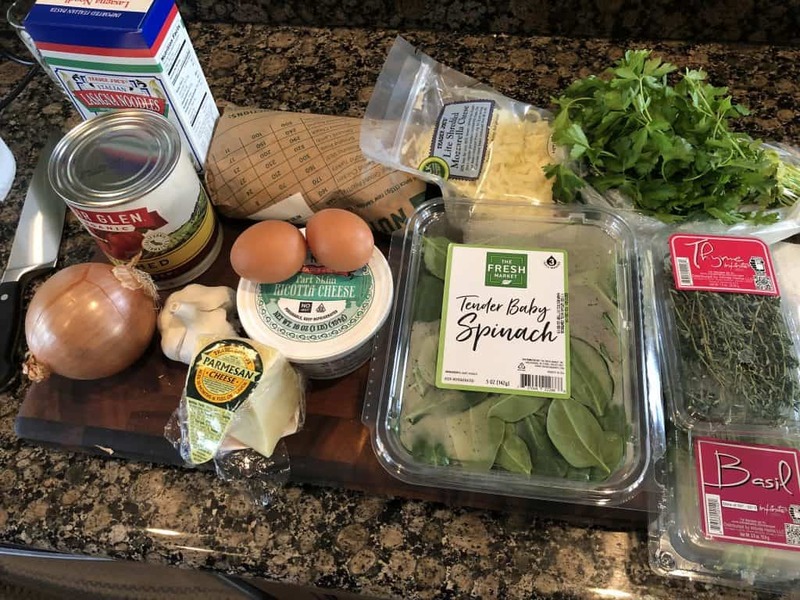 Smooth the rest of the ricotta over the pasta sheets and add the rest of the spinach over that. 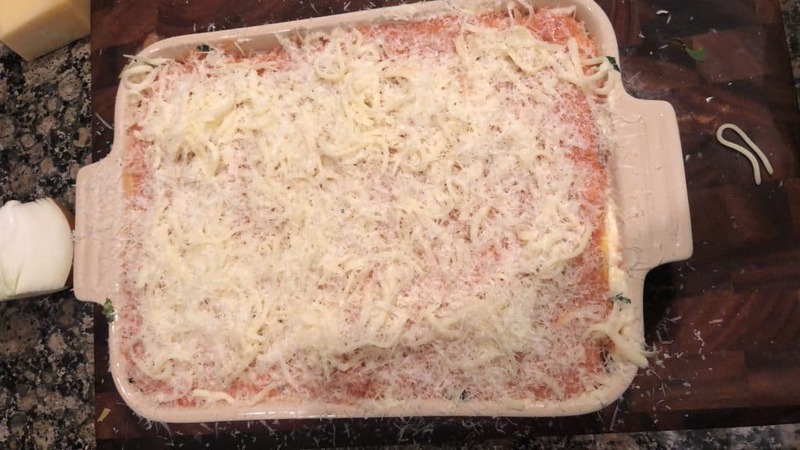 Add the final layer of pasta sheets, followed by the tomato bechamel, the rest of the mozzarella, and freshly grate parmesan over the top. I like to take a few pieces of butter and disperse them over the top so it gives you that golden brown top. Cover with foil and place in the oven. If your lasagna is full to the brim, you can grab a baking sheet, cover with foil, and place the dish on top of that for any spillover. Bake for 35 minutes, then remove foil and low broil for 10 minutes until the cheese is brown and bubbly. Garnish with fresh basil and serve with a spatula. Prep time is 10 minutes for chopping ingredients + 15 minutes for assembling lasagna after cooking components. 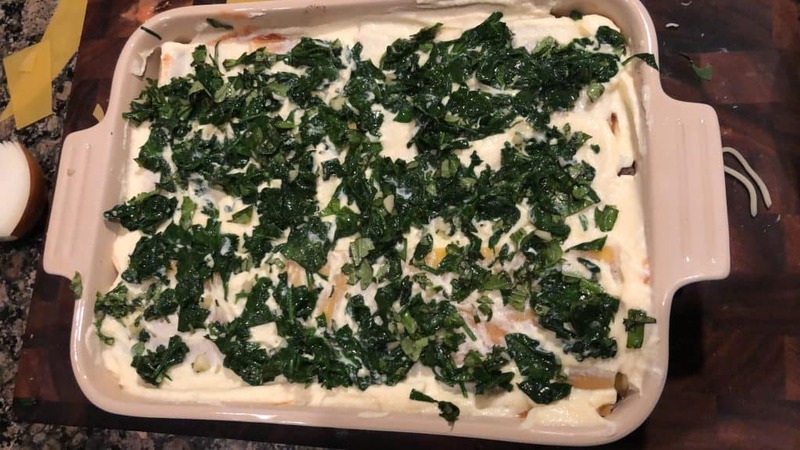 Cook time is 25 minutes for spinach, beef, sauce; then 35-45 minutes for baking lasagna in the oven. 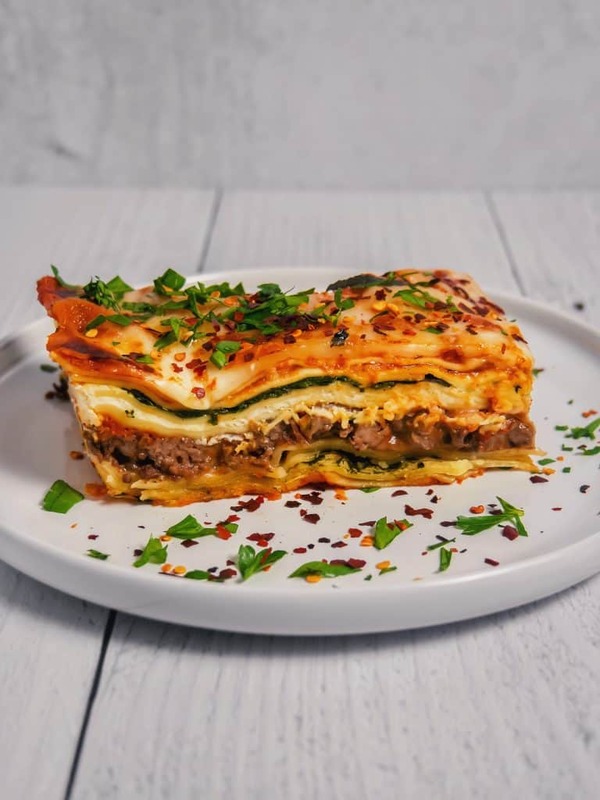 If you cannot find no boil lasagna sheets, you can cook lasagna sheets al dente and use those. 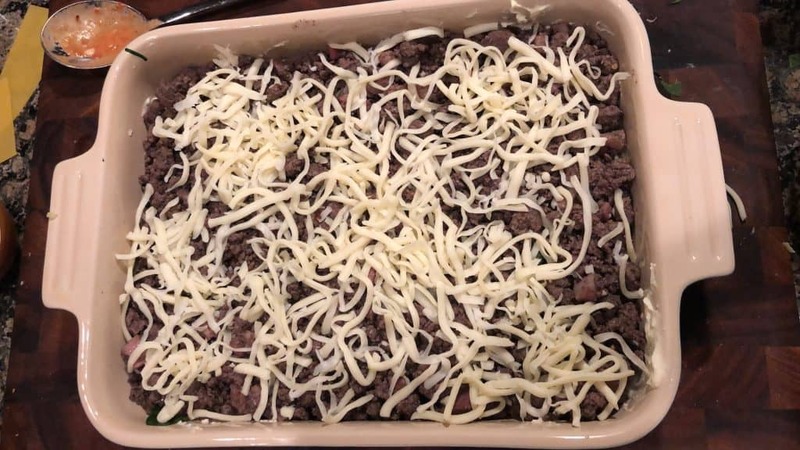 Ensure the foil isn’t wrapped too tightly on the baking dish or the cheese will get stuck to it. Absolutely loved this recipe! 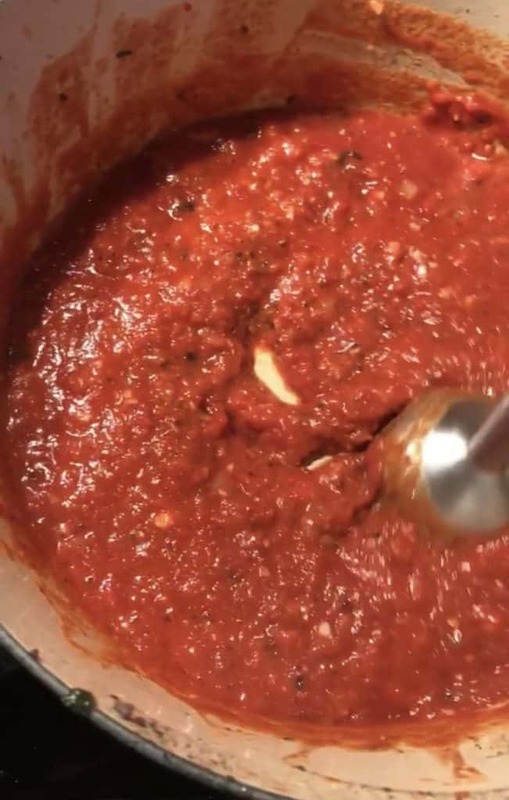 It sauce had a nice kick to it, and was super tasty! Will definitely be making this one again! I loved the sauce, the spinach and the addition of pancetta with the beef. However my noodles went to mush. Prep was at least an hour, instead of the 25 minutes in the recipe. I’m going to try the sauce and meat with regular pasta instead. Hi Lisa, so glad you loved the sauce and meat mixture! I’m sorry for the confusion on the prep and cook time. I set aside 25 minutes for prep for: dicing pancetta, chopping spinach/onions, mincing garlic, and then the actual layering of the lasagna. The 70 minutes cook time was a total time for making the spinach, beef, and sauce (these 3 took me 25 minutes), then the final 35-45 minutes for baking the assembled lasagna in the oven. I am going to see if I can divide up the times in the summary to make it more clear. For the pasta, did you use no boil lasagna sheets? I am trying to figure out why they came out so mushy. This was DELICIOUS!! I skipped the spinach because I didn’t have any, and doubled the ricotta (because why not!? ), and it was a huge hit! Will definitely keep making this one! I’m so glad you loved it Libbi! I’m all for double the ricotta, so good!